Here at Cornerstone Chem-Dry, we love our pets. They brighten up our day and they’re always there to support us, through thick and thin. However, they can make it a real challenge to keep your home clean, healthy and smelling fresh when pet accidents occur. Not only is it difficult to deal with a pet urine accident once one has occurred, but it’s also tough to know where past accidents may have taken place, including accidents you may not have even known about. Using a special UV light, we can detect pet accidents in your home and eliminate pet urine odors from your carpets, rugs and upholstery through our revolutionary cleaning process called P.U.R.T.® (Pet Urine Removal Treatment). P.U.R.T. contacts the source of the odor and immediately begins a chemical reaction that destroys the pet urine odor. It’s shown excellent results on even the most severe pet urine damage. An independent laboratory recently conducted multiple tests of our P.U.R.T. process to determine its effectiveness in treating pet urine odors and stains. In tests against the most common odor sources found in dog and cat urine, this study found that P.U.R.T. removes an average of 99.9% of pet urine odors from carpets. To go one step further, the study also tested our ability to eliminate the bacteria that can be found in pet urine. When used along with our HCE (Hot Carbonating Extraction) cleaning process and a sanitizer, the study found that P.U.R.T. 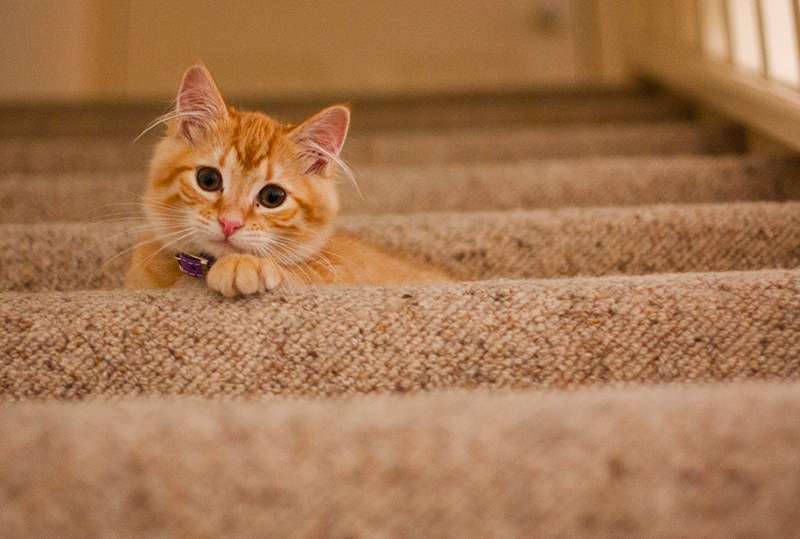 removes an average of 99.2% of the bacteria from pet urine stains in carpets. Pet urine in the carpet not only leaves an unsightly stain and an unpleasant odor, but it penetrates the fibers and contaminates both the carpet and the floor underneath. That’s why it can require specialized cleaning, well beyond just a simple cleaning and treating. The longer an incident goes untreated, the more likely the urine odor is to permeate deeper and deeper into floors, walls and even the framework and foundation of the home. As the urine dries, the liquid evaporates but the urine crystals become even more concentrated and pungent. Simple cleaning will not remove this odor. To help rid your home of the smells caused by pet urine, we apply our specialized formula P.U.R.T. – specially designed to eliminate pet urine odors at their source. While most cleanings only masks the odor, our revolutionary Pet Urine Removal Treatment works at the molecular level and destroys the urine crystals to fully eliminate the odor. 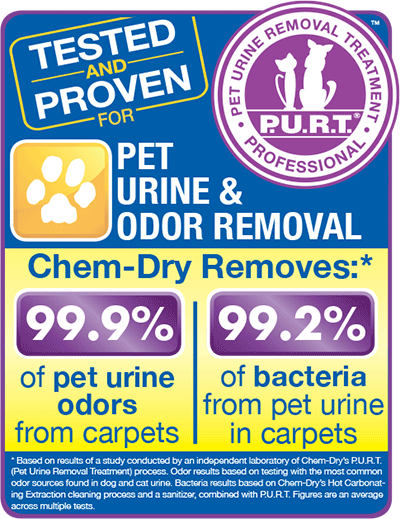 With P.U.R.T., your most severe pet urine odors can be solved and your carpets, rugs and upholstery can be saved. First, we will do an inspection of your carpets with a special ultraviolet light. This light exposes any problem areas and odorous urine deposits that may not be visible to the naked eye. Next, the carpet will be rinsed with our deep cleaning, patented Hot Carbonating Extraction (HCE) cleaning process to remove any liquid or loose urine crystals. 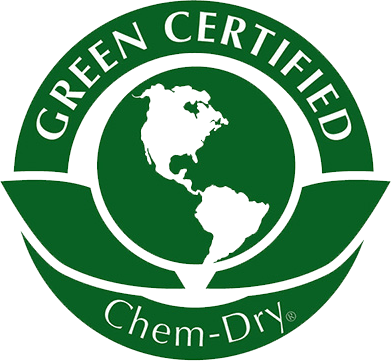 At Cornerstone Chem-Dry, our goal is to clean for your health and the health of your family. We provide a healthier, longer-lasting clean for a happier home. P.U.R.T. and our other Healthy Home cleaning products are safe and non-toxic for you, your children, and your pets.